Even if you think that a “Fair Catch” has something to do with a summer carnival fishing tournament and a “Flea Flicker” can be eradicated with a dog collar, there are two things that all football and non-football fans know: The crazy intensity of the championship football season is among us. And, the only football teams that prove themselves worthy of achieving this level of greatness are the ones that are the epitome of a Well-Formed Team™. Long ago, before Scrum was Scrum, a model of Team development was introduced to the world, setting the standard for understanding how Teams evolve. 50 years later, Tuckman’s model of Forming, Storming, Norming and Performing, while not specific to the world of Agile, still holds strong. According to Tuckman’s theory, all Teams must proceed through a distinct order of stages to evolve to the ideal state of Performing, or as we call it, becoming a Well-Formed Team. A short-lived phase; the Team gets acquainted, learns roles and responsibilities. A challenging period; as the Team experiences disagreements, power struggles and conflict emerge. The Team discovers the light at the end of the tunnel, establishing guidelines and understanding process. The Team gets it; collaborating, anticipating and adjusting. Work is efficient, and the Team is motivated. In football, it’s easy to see what a Well-Formed Team looks like. While they may start out the pre-season Forming, by the time division playoffs are happening, they are rock solid Performing. Every member knows their role in the Team. They work as a whole. They anticipate, inspect, adapt and work hard toward a common goal. Barring injury, the Team remains intact as a unit; well versed in what to do, why to do it and when to do it. The result? They win the game. Sure, we’ve been talking football this whole time. But, you knew we’d bring up Scrum soon. There’s no reason a Scrum Team can’t function the same way as those giants of the gridiron. 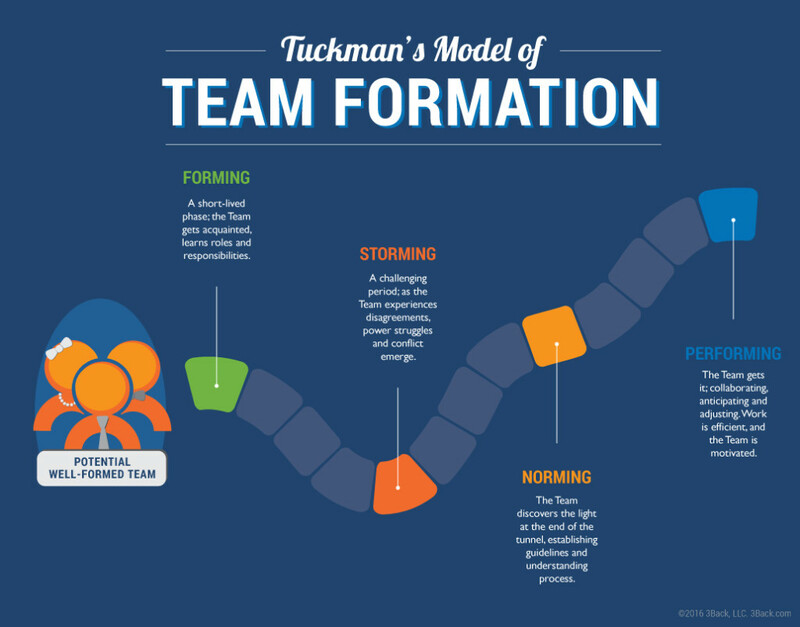 Scrum Teams need the time to evolve through Tuckman’s stages to achieve greatness. That’s why we are always surprised when some organizations choose to disband and reform Scrum Teams with every project, effectively eliminating the Team’s ability to evolve. Unless there’s an overwhelming extenuating circumstance, we maintain that Scrum Teams should stay intact. Otherwise, they’ll never make it to the Championship. Tired of hearing from Monday Morning Quarterbacks in your organization? Ready to improve your Team’s Agility? We’ve got coaching for that. we’ve got a white paper for that too. 1 In case you were wondering, a Fair Catch is a signal the kick returner gives by waving his arms. When this happens, the opposing Team is required to allow an uninterrupted opportunity to the returner to field the football. 2 A Flea Flicker is a trick play by the offense that involves the running back throwing a pass backward to the quarterback, followed by the quarterback throwing a forward pass to a receiver. 3 “Well-Formed Team.” Accessed January 25, 2018. https://scrumdictionary.com. 4 Developmental sequence in small groups. Tuckman, Bruce W.Psychological Bulletin, Vol 63(6), Jun 1965, 384-399. http://dx.doi.org/10.1037/h0022100.